St. Patricks Day celebrations come in all shapes and sizes. I’ve never been much of a St. Patricks Day guy – I’m not Irish. It’s just an excuse to get drunk; and like today for instance, it’s a Monday. Horrible day of the week to tie one on. Let’s be real. If you went out last night and you’re over the age of 24, you should carefully reconsider. It was a Sunday damnit! 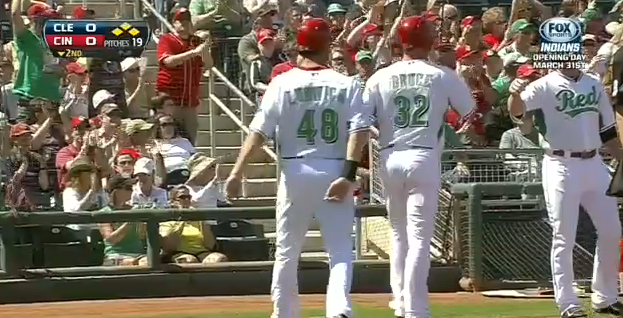 The Reds celebrated by beating those dirty Cleveland Indians 5-4 in a meaningless spring game. That shot above came from the tail end of a Todd Frazier double. I just learned that The Toddfather became a father, so there’s another reason he’s in for a big year.